Candy science is one of my favorite science activities. Making rock candy is easy to make and can easily double as a science experiment. The process may take several weeks depending on how big you want your crystals. Kids love watching the crystal grow as they form on the stick and especially love to eat the finished product. We turned out candy science into a science activity by making our rock candy with three different kinds of sugars: white sugar, brown sugar, and powder sugar. Our intention was to do the scientific method to see which sugar grew bigger crystals, but life happened and even though we were watching, and discussing what happened every day we forgot to write down our observations. Just as always as long as children understand the point of the activity and understand the conclusion, then I always deem it a success. We started with two cups water and four cups sugar. We made three different solutions each by adding different sugar to each batch. 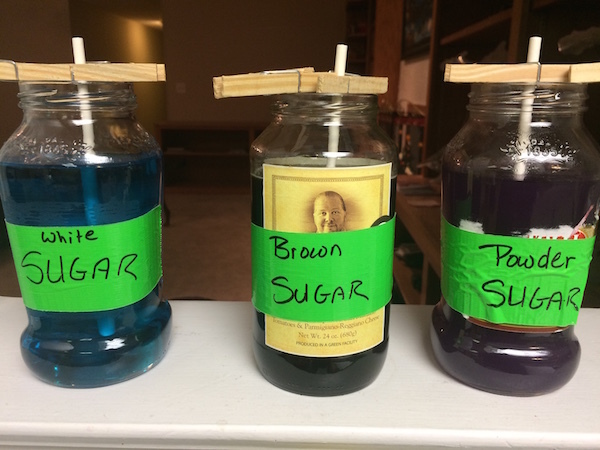 The stick was covered in the appropriate sugar, color and flavor were added to the jars, and labeled each bottle. The solution was brought to a boil and cooled for 15 minutes, poured the solution into the jar, position the stick and then waited and watched. It was fascinating watching the crystal form over the next couple weeks. The girls decided the white sugar actually worked best to make rock candy. They determined that the brown sugar had way too much molasses for the crystals to form on the stick and the powder sugar was too small. This entry was posted in Cooking recipes, science, Unschooling and tagged candy science, crystallization, education, rock candy, steam, STEM by Chrissie. Bookmark the permalink.